There have been many times where I have felt socially awkward, and I’m trying to change that. I’m always enamored with people who feel comfortable in most situations – the ones who can always speak their minds, no matter what anyone thinks. I’d love to be one of those people! If you read my blog, you know I have some health issues: fatty liver, IBS, SIBO, degenerative disc disease, vertigo, low thyroid, and gluten intolerance. I don’t have insurance and work on my own behalf with the help of a Naturopathic Doctor towards health. This has brought me to a place where I practice yoga and meditation every night before going to sleep, along with dietary changes, suppliments, and bodywork. I thoroughly believe I can heal my liver, and that will help all bodily systems. Why am I writing all this openly…? Well, last night during my meditation, I was overcome with a wave of extreme emotion – as in immediate sobbing – I think it was a sort of breakthrough. I was thinking about how next year is my 30th HS reunion year – which is big. I graduated early in January 1987, and I was kicked out of my family’s house that February over religious differences… locked out, actually. My memory went right to my 3 younger sisters crying behind the oval window in the big front door of my house after the folks locking me out because I spent the night at a friends house who wasn’t a Jehovah’s Witness. The realization that that was my last encounter with any of my sisters -seeing or talking to them… and it has been almost 30 years! It hit me like a ton of bricks. I worked through my whole routine while crying. I thought I was emotionally ‘over’ all of this stuff – it has been 3 decades after all… but no, all I could think about was the family I lost due to religion. Three sisters, 30 years. I don’t even know their last names since they’ve all been married. So sad. I also have a brother who was born after I left home – I have yet to meet him, but he recently left the religion too! I may have a bit of family after all… but, my real question is this: How do I grieve a family that is not even dead, people who only choose not to talk to me…? It also made me think of my youth, and how separated from everyone else I was. I was 5 when my parents ‘found God’ and we moved to the middle of nowhere in the country. I was isolated just by where I lived. Plus,we weren’t allowed to celebrate holidays, so I had to sit in the hallway at school for every event. I was also not allowed to pledge allegiance to the flag, and many people gave me the stink-eye for that too. I didn’t get to do any extra-curricular activities, or have friends that weren’t JW’s. To top it off, most of the JW friends I did have, didn’t hang with me much due to the fact my dad was an elder in the congregation, I think they avoided me so they wouldn’t get it trouble themselves. So… I’ve always been a bit of a loner. After a bit of memory flash, I started thinking of the relationship with my own daughter, how wonderful it is – how wonderful she is. And I just can’t, for the life of me, imagine kicking her out of my life – over a difference in belief. I love her so much… makes me wonder just HOW my parent’s can hold tight to their “tough love” approach for all this time. I just don’t understand. I think it’s important for me to figure this out. 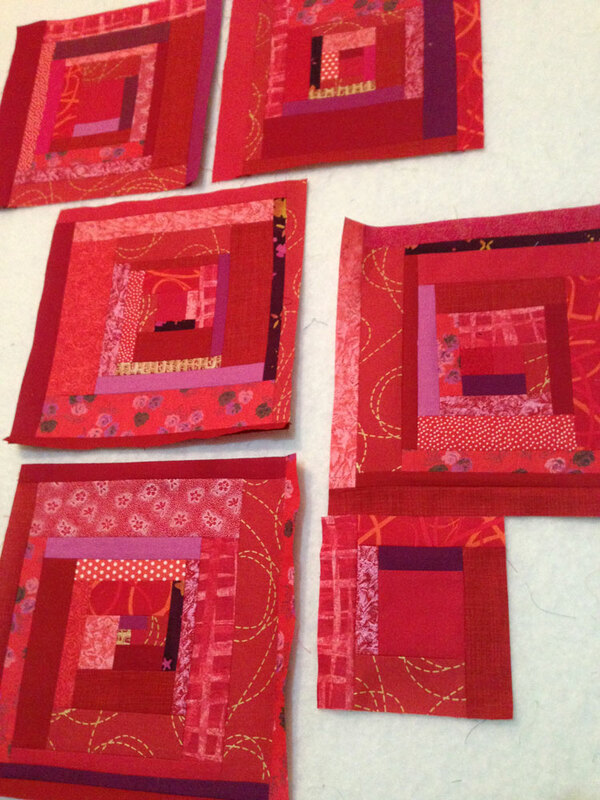 I need to vent or release these emotions – of course what comes to mind is making a quilt. 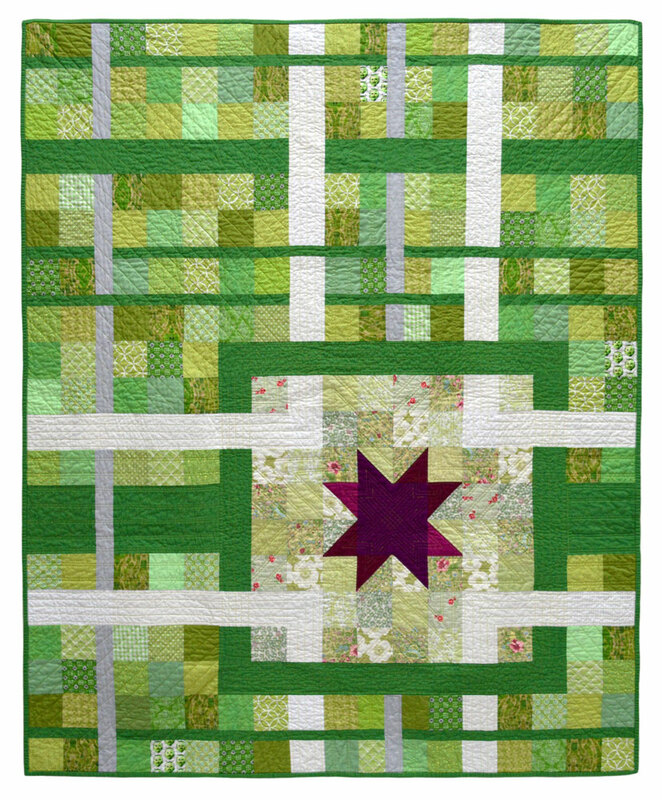 I think I need to make a quilt that will help remember my family with love and forgiveness, and then be able to move on. I had hopes that at some point they would open their eyes and see things for what they are, and leave that religion… or at least be open to respecting my beliefs so we can have a relationship again. Those hopes are dwindling down to nothing, and I have to come to terms with the fact I may never see or hear from them again, which I have to admit, seems worse than if they had died. I have always been set apart from the group, and the one group I thought truly loved me (my family) has separated themselves from me. I think this is all part of why I feel so awkward and uncomfortable in most social situations, but I’m getting better. It just makes me think of all the multiple reasons some people are socially awkward… and I have a lot of empathy when I see it. You just never know what someones’ experience might be. Thanks for reading my thought release from this emotionally heavy meditation. 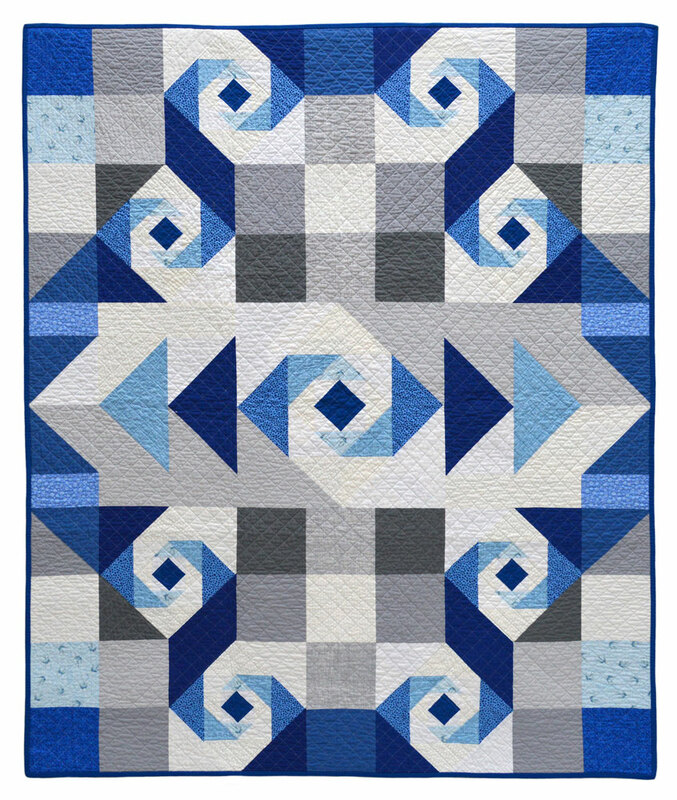 Sharing is very therapeutic in ways I can’t quite put my finger on… and it is also inspiring me to start a new quilt project. It will be interesting to see what visually comes with this release. 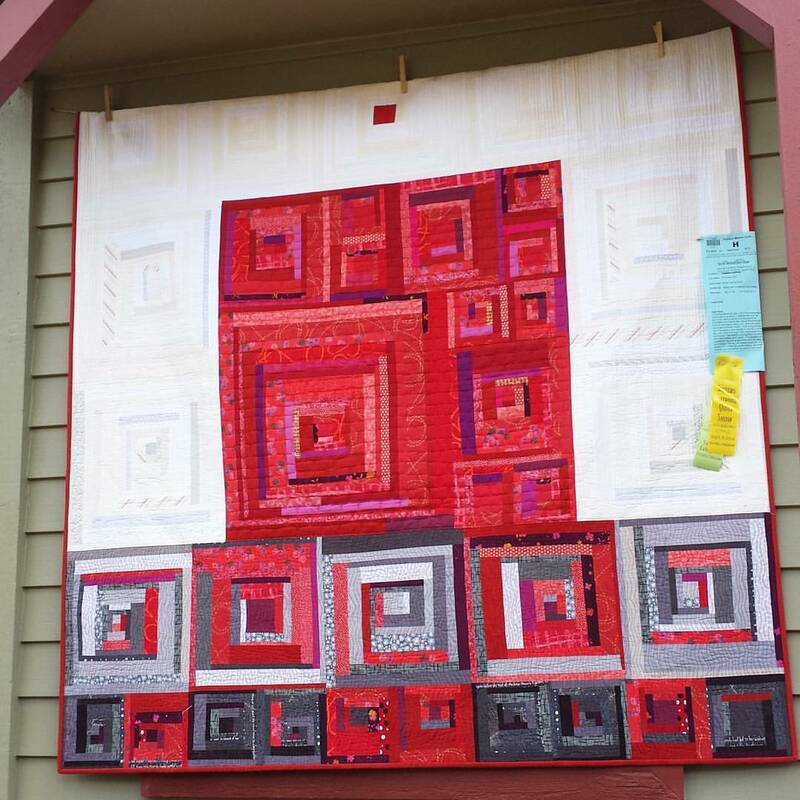 I did the same thing when I made my Root Chakra quilt as I was dealing with emotions that dealt with fear of death, a need for health, and a foundation to base it all on. 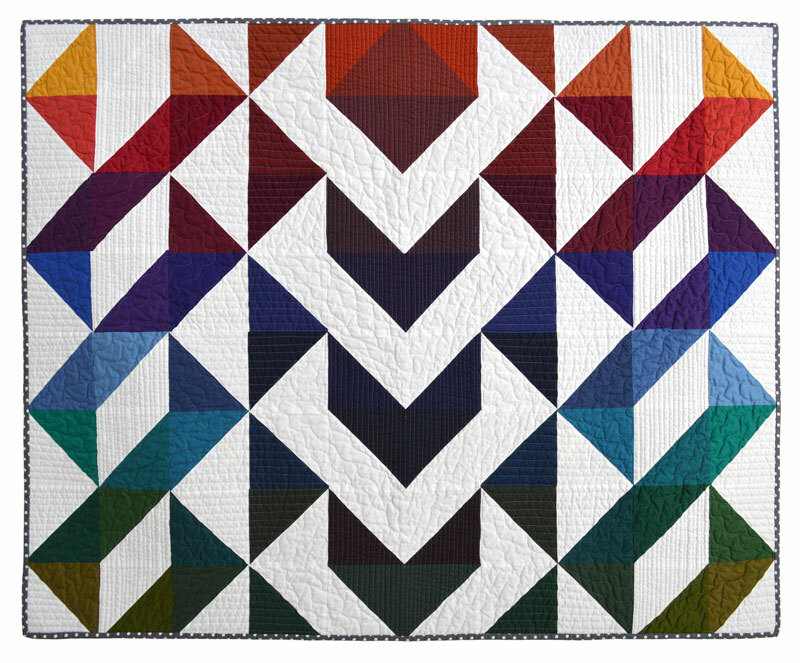 That quilt really speaks to me and I’m proud of the work I did on it, both visually and emotionally. I guess I haven’t written a post in a while… I’ve been questioning my purpose of this blog, and if it serves anything more than just a place to show my work. So, I’ve recently decided to give pattern-making a shot, and share some tutorials here. I’m almost finished with the Wood Dragon EPP Hexie Pattern, and the Squid and Jellyfish will be following as well. 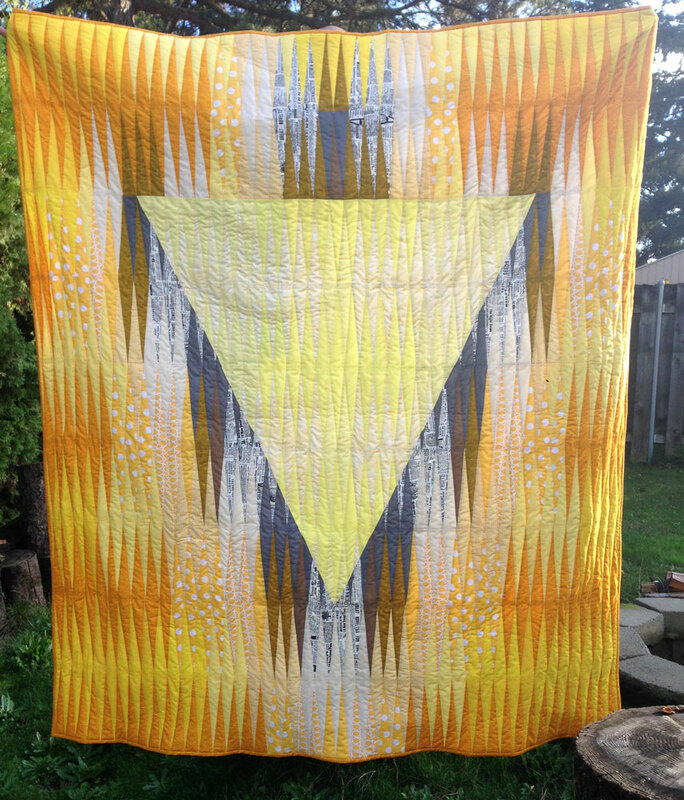 I do have a quilt finish to share: The Root Chakra Quilt is finished! I showed this at the last PMQG meeting, and I was able to tell a little about it before my nerves erased my voice (I have such a hard time speaking in front of people)… but I didn’t really share much in details. 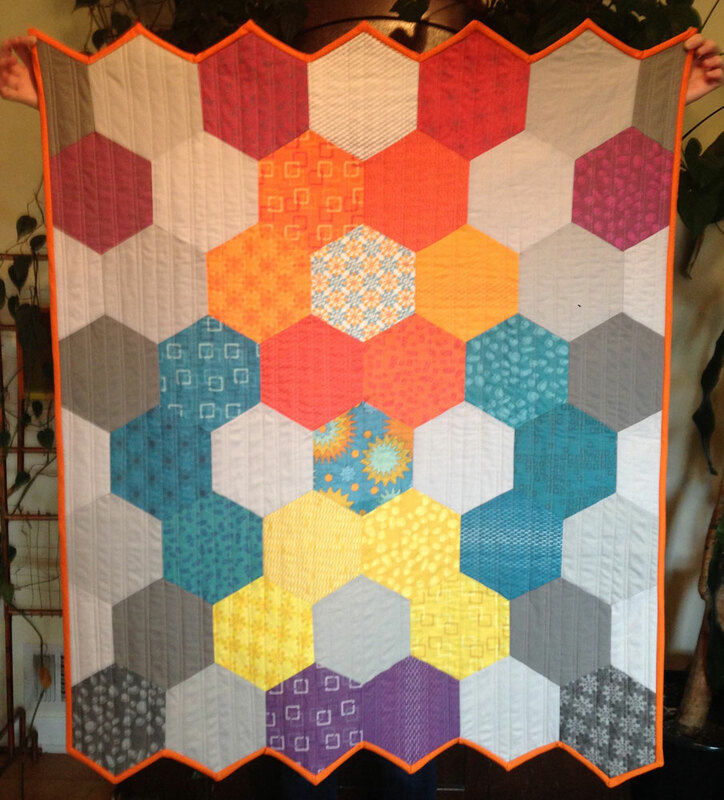 … so I made a quilt to help me heal. The symbol of the root chakra is a red cube, and it governs family and foundation. I guess since I have been ousted from my blood-family (due to religious differences) my foundation is pretty weak. 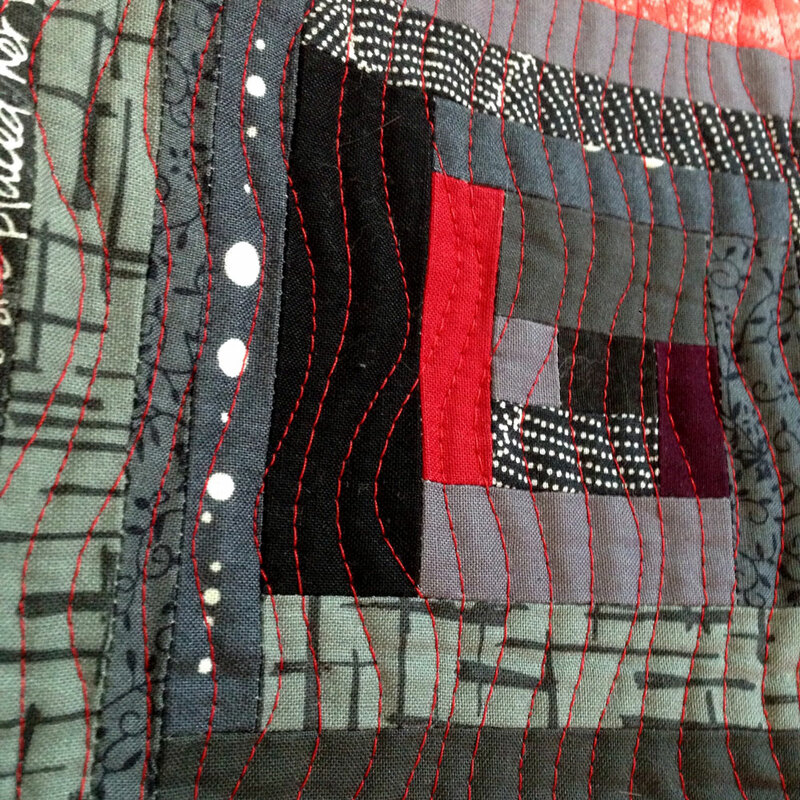 So I chose the Log Cabin block to explore… the red center of a log cabin is symbolic of home and hearth – perfect for my purpose. The bottom row of log cabins were made of black and deep red centers to represent my upbringing which was strict and solid… and a bit dark, due to the fact it was all conditional love. The second row represents my young-adulthood. 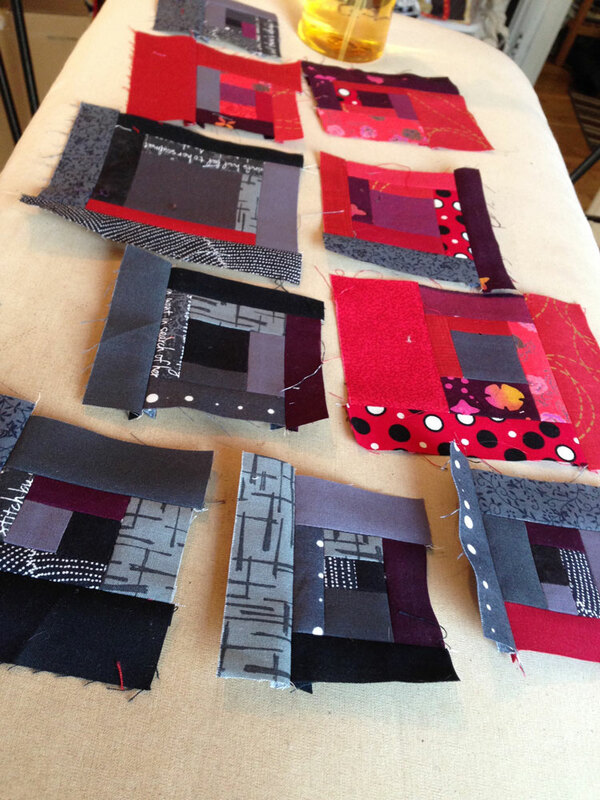 These have dark red and grey centers, along with mixed colors in each block to show my lack of boundaries and the excitement of new people and ideas. 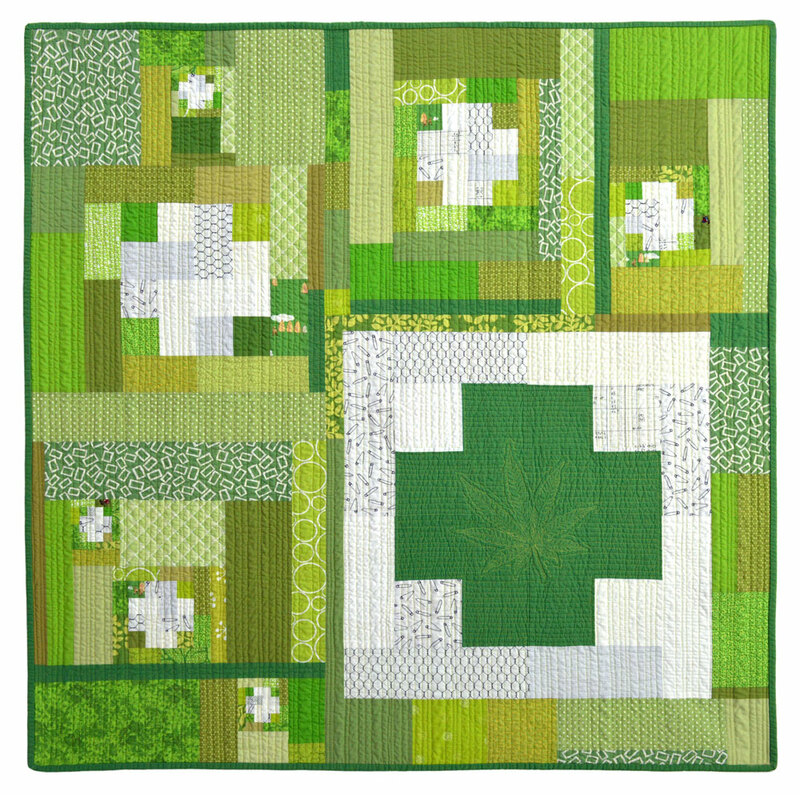 The big red center block is made of many smaller ones, this in a field of mostly-white to represent the now. My world is much more solid now… but still messy – it’s still a work in progress. 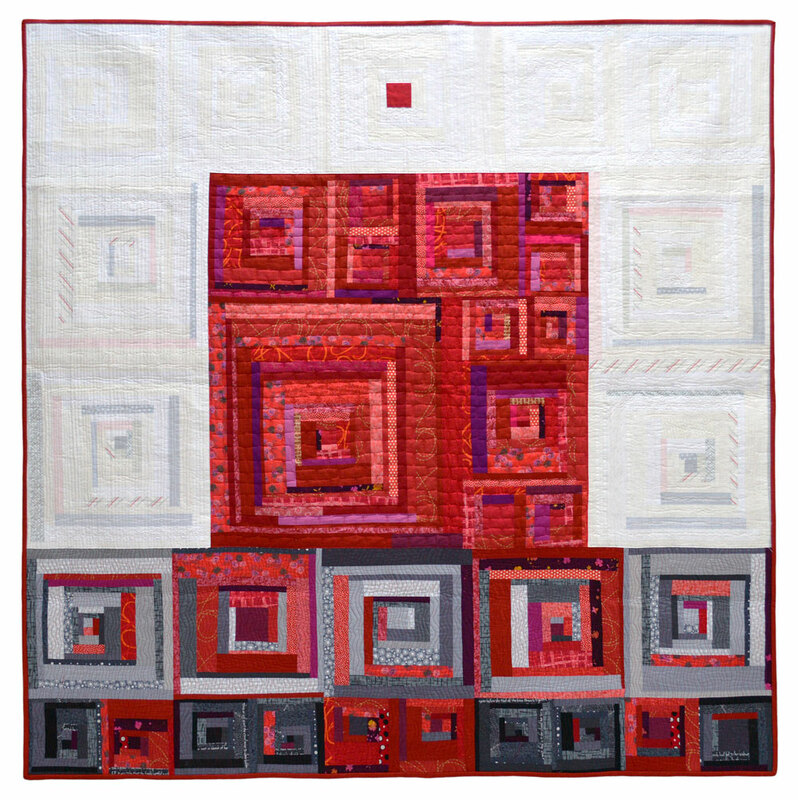 Searching for that perfect foundation – the solid red square surrounded by white in the top row, so I can move forward in my healing process. 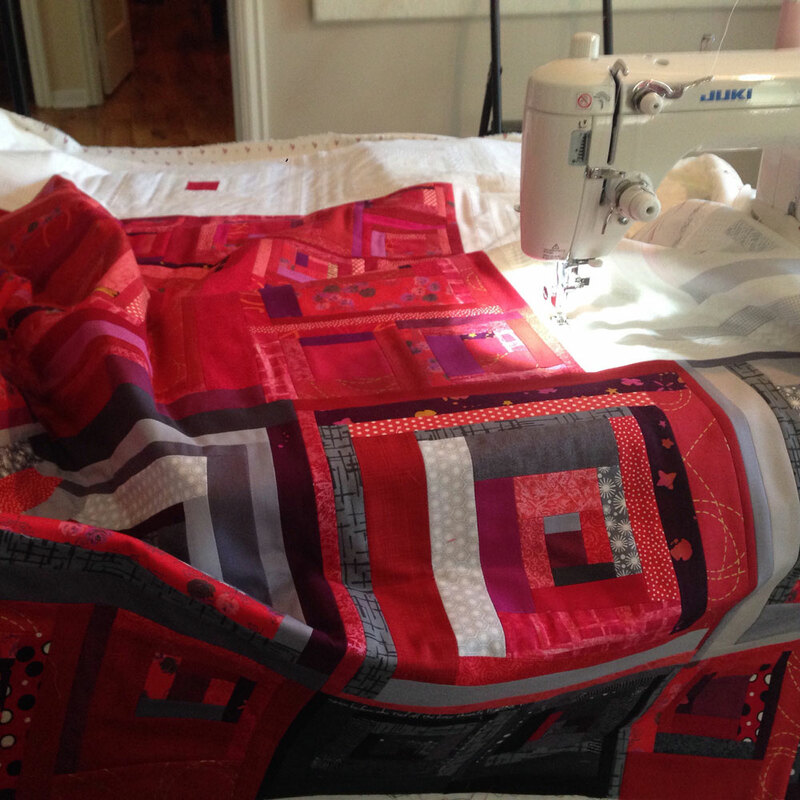 As I was sewing this quilt, I reminisced on old friends, and some of the poor decisions we made as young people. I also thought about how far I’ve come: working from homelessness to home-ownership via my own business… and about how much further I need to go. 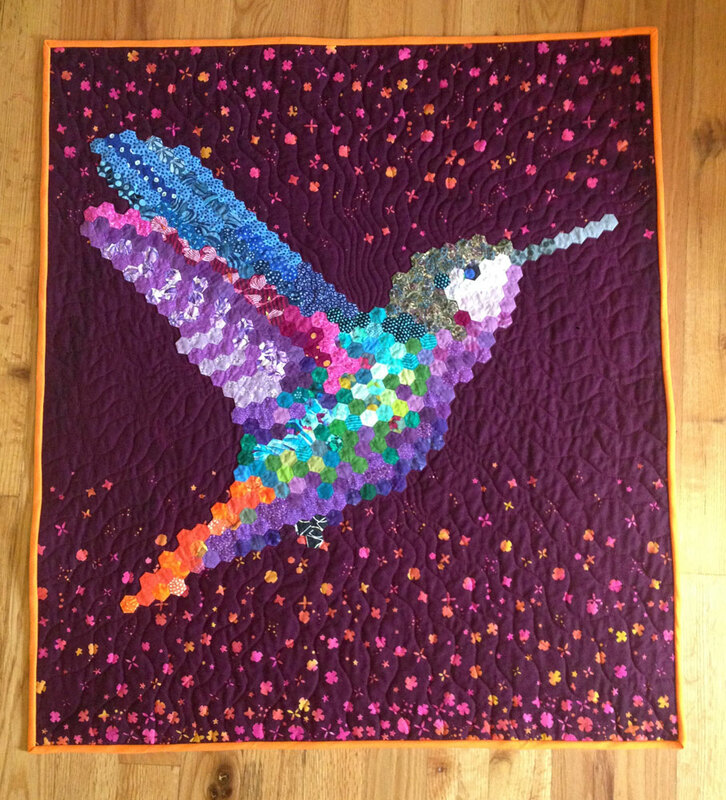 Art therapy – this is definitely an emotionally charged quilt! 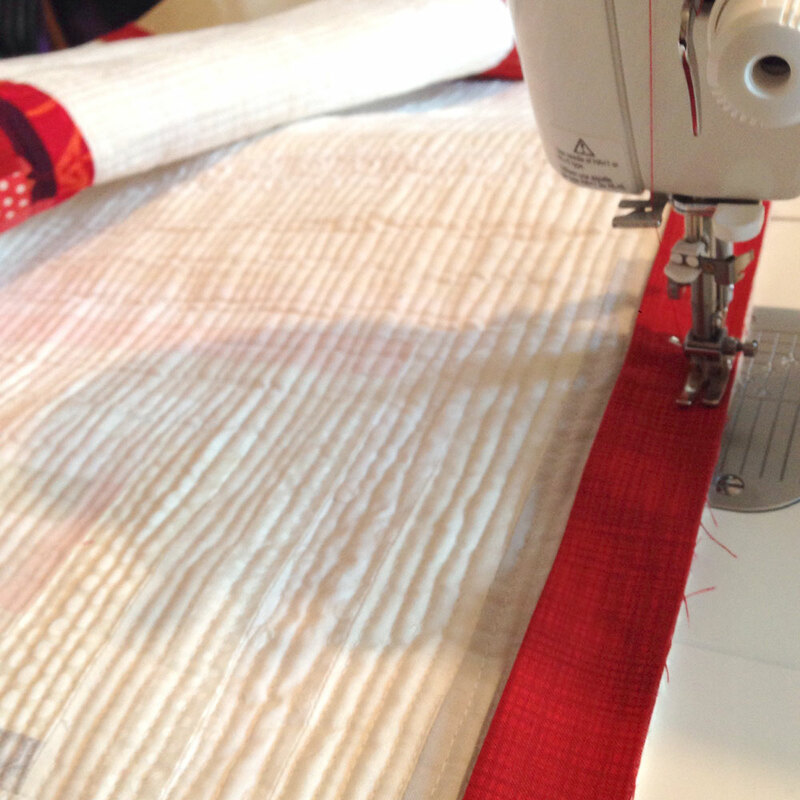 The whole time I was stitching this quilt I was also listening to many podcasts at The Crafty Planner – and as I listened, I learned about a lot of different quilters out there and that just about everyone has massive life struggles. It’s been great hearing stories of success coming from hard work and love of this medium. I recommend it! Plus, it really makes the time fly, which is great when you’re spending hours on the machine! So… one more finish on the books that I can be proud of! 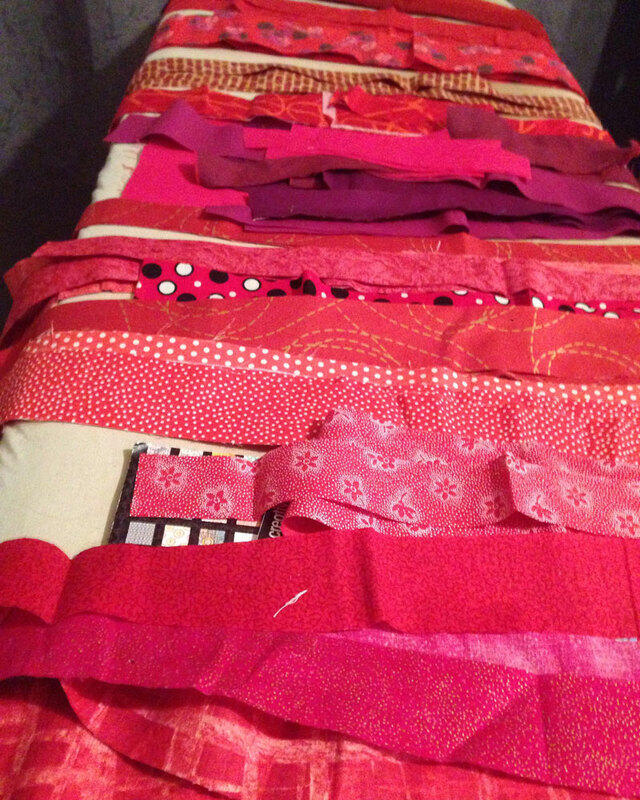 I think I’ll follow through and make a quilt for each chakra – it will help me go through my stash and challenge me emotionally in a good way. The next one is the Sacral Chakra which is the center of feeling, emotion, pleasure, sensuality, intimacy, and connection. Lots to think about! 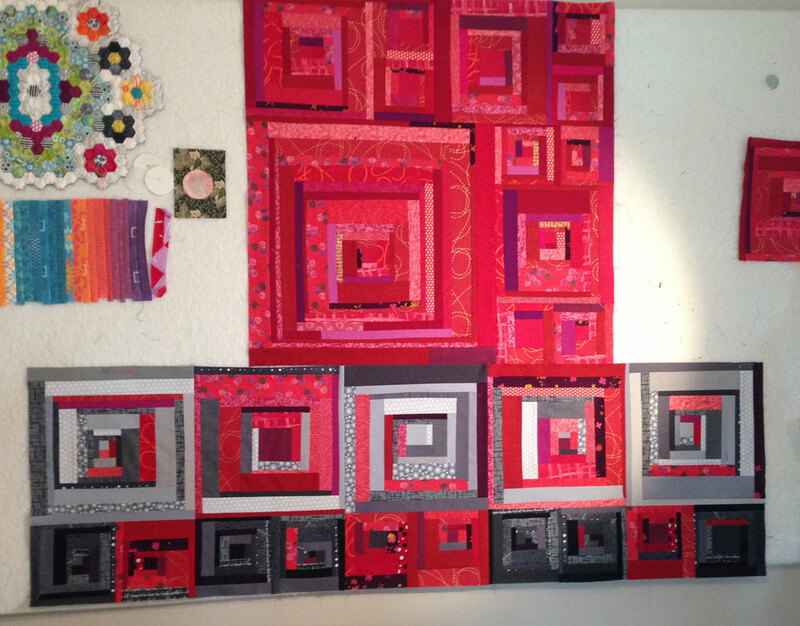 In the meantime, I plan on sharing some hexie patterns very, very soon. What are you working on? 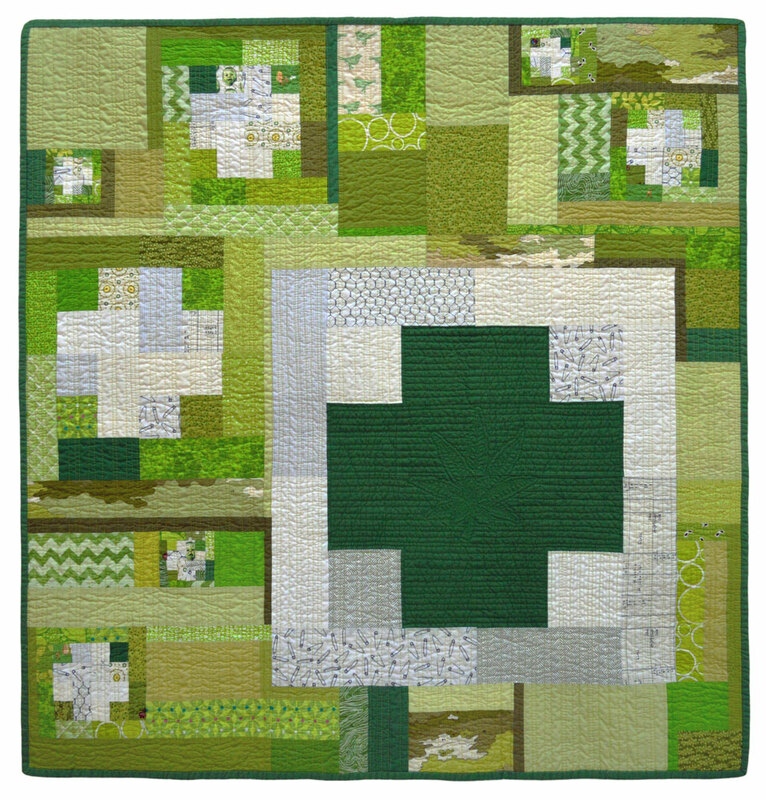 Does quilting help you emotionally?